Think Pink! & La maglia nera revisited. It was a story concerning la maglia nera, the black jersey of the last man to finish the race. Interestingly, I determined from the article of the only two time winner of the coveted black jersey. His name was Luigi Malabrocca, a rider that won it in 1946 & 1947. The picture below is the famous bike builder Giovanni Pinarello who won the last black jersey in 1951. 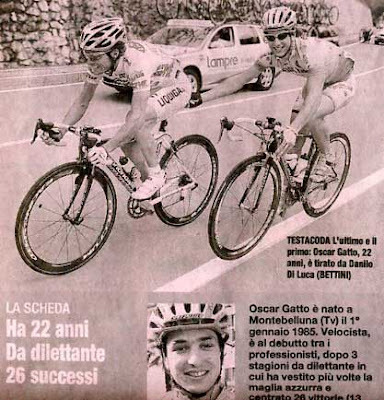 The bottom picture is 22 year old, Oscar Gatto(Gerosteiner) who won the distinction in last years race. He's the one that's holding on to Danilo Di Luca's saddle. The black jersey was abolished ... because of it's negative connotations. What negative connotations? How can a very cool black jersey be negative? All 3 riders appear to be smiling! In it's place a white number on a black backdrop - for the rider's jersey and bike. What did the young Gatto have to say after he came in last? "To finish the Giro is always better than abandoning." Classy words! Oscar Gatto will be lining up with his Team Gerosteiner mates at Palermo for the team time trial with perhaps a twinkle in his eyes of defending his numero nero. Black is beautiful! Giovanni Pinarello's big 1951 Giro win. The first and the last. Oscar Gatto holding on to Danilo Di Luca's pink. Wouldn't he look better in black? 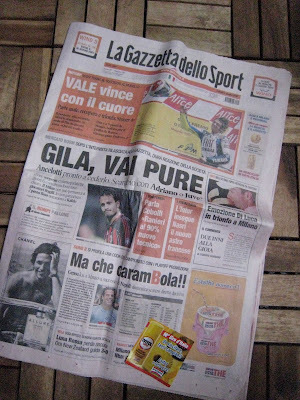 La Gazzetta dello Sport 6/04/07. (Top photo): The front page of the famous pink newspaper. Surprisingly, the Giro article didn't start until well into the paper, on page 31. Which begs the question: Is cycling not the number 1 sport in Italy? Sadly, no! Motocycle racing and Football holds the top 2 spots! Courtesy: from Hans, who was there and brought me back a copy! (Second photo): 2 time record holder of the black, Luigi Malabrocca. Is it still printed on pink paper? The black jersey is very stylish, I agree. Yes, in it's fashionable pink! Pinarello has brought out a black jersey to honor Giovanni Pinarello's experience!